The February Essentials by Ellen Release is now available! This release is full of amazing goodness from Julie, including a new Mondo flower, TWO coffee sets and some new sentiment dies. Links are below. I made this card with the daisy, my 'MISTI-turn' technique and some fun Copic-dot colouring. I started by placing the daisy so that I could get it close, but not overlapping when I turned the panel in my MISTI. I needed to use my original-sized MISTI so that I could stamp the daisy off the edges of the panel. I used the measurements on the MISTI, to make sure that each daisy edge was close to the centre of the panel edge. I was still surprised when it all worked out though! Then I coloured the daisies, using cool grays for the petals and warm yellows for the centres. I marked the back of the panel so I knew which side was the 'top', just to help with the shading on the flower centres. Next, I used several blue/purple/aqua Copics to dot the background. I love the look this technique gives! Finally I added the sentiment using the new Big Scripty Hello die. I cut the shadow from vellum and put some Stickles around the edges for sparkle. I stacked up 2 black 'hellos' and glued them to the vellum. To glue the sentiment to the card, I put liquid glue on the back but only where the black hello was, so that it wouldn't show through the vellum. 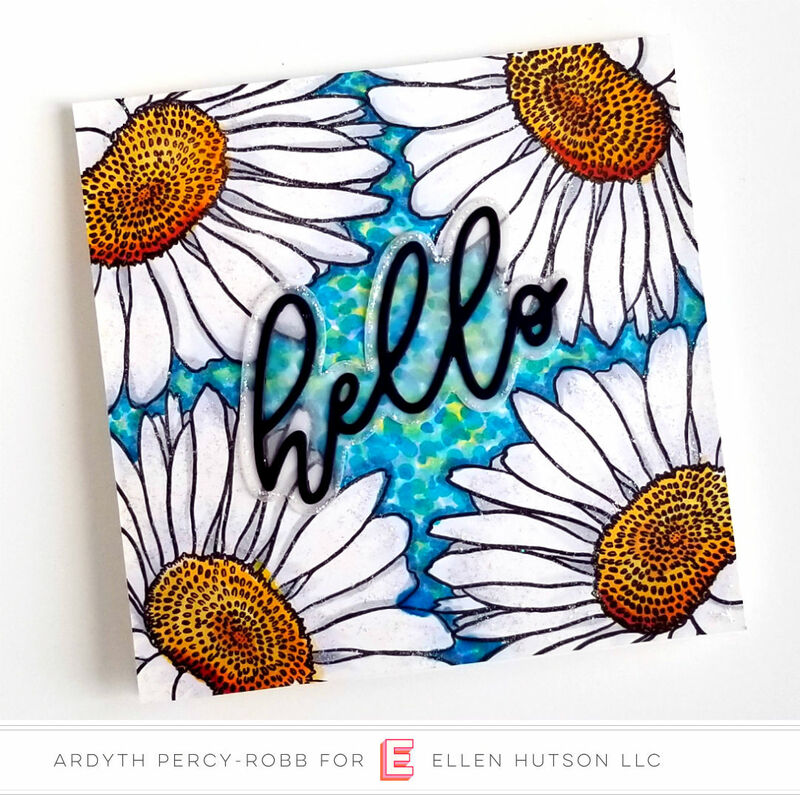 This daisy stamp is terrific, and your card is lovely! Such a pretty daisy, your card colours are so vibrant & cheerful. Thank you for sharing. Very pretty card. I love the dotted background, so easy and such a different look.